electric bike was not an option! It's in the genes, that much is clear. Bram's mother is almost 84 en does around 6000 km all year round on the bicycle. Up till now she used an already lightweight custom-made bicycle with Cr-Mo Reynolds tubing. So, the weight of this city bike was already little with approximately 12 kg, but starting and stopping it was a bit hard because of the relatively high positioned top tube. Therefore a full carbon lightweight bicycle with a much lower frame curve and obviously a lot of lightweight M5 components (hubs, brakes and rims) was made. The result is a remarkably rigid, smooth and lightweight (7.3 kg) carbon city bike with a 9 speed gear system. The crank is acquired from another recumbent builder in the USA (Lightning). Two carbon chain rims around the 42 toothed blade make sure the chain is kept perfectly in place. The Dutch version of the article also mentions that a 250 gram extra light rear rack is being made for the bike. Hopefully she'll get mudguards too. These are all parts of what make up a practical bicycle for everyday use. Cycling is for all demographic groups in the Netherlands. While Bram Moen's mother may be exceptional, Dutch people over 65 on average make a quarter of all their journeys by bicycle. Please read more about elderly people cycling in the Netherlands and about cycling quickly in the Netherlands. Bram is making the rest of us look like ungrateful children. Any plans to go commercial with that design? Beautiful. Whenever customers ask us to build an electrically assisted bike for them we first inquire whether a more efficient, non-assisted bike wouldn't be adequate. It's certainly simpler and less maintenance intensive. But this does often lead to resistance, since the Dutch are so accustomed to riding old bikes in poor condition that it can be difficult for them to imagine that pumping up some quality tires, servicing their drivetrain and bearings and fitting the bike properly will actually make a difference. In this month's 'Vogelvrije fietser', the magazine of the Dutch Cyclists' Union, there is an article where starting from a bike with good (efficient) components, the author investigates the 'cost' of cheaper components. 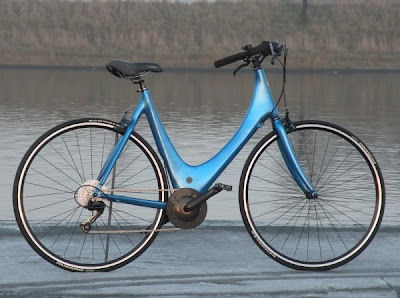 The original bike requires 55 Watt for 18 km/hour, the worst case came in ad 138 Watt for the same speed. Of course the under inflated tires was the biggest difference, but there were others (avoid the Shimano 7-speed Nexus hub gear, it has no direct drive). Me mum could use a bike like that; and I'd even let her ride now and again when I wasn't. Hi Maarten, I read the Vogelvrije Fietser ("outlaw cyclist") article a couple of days ago. Very good it is too. They really measured things, using SRM power meter cranks. No guesswork. As you say, tyre pressure was the big thing (25 W difference), but also tyre type (15 W between fat city bike tyre and racing tyre). These were far bigger issues than upright vs. leaning over position. As for the Nexus 7, both Judy and I have them on our town bikes. They are a little inefficient (12 W wasted), and I noticed it compared with an old Sturmey Archer 3 speed (which is much more efficient than most people imagine), but I don't think they're all that bad for that application. At least we get to have a full chain-guard, which avoids the rusty / dirty chain problem (Vogelvrije Fietser measured just 1 W loss due to a dirty chain, but I think we've all seen rustier, dirtier chains in use than theirs). The loss in efficiency overall is almost certainly a lot smaller than that suffered by anyone riding a mountain bike with low quality knobbly tyres on the road - especially if those tyres are under-inflated. It seems both HenryInAmsterdam and David miss the point in VogelVrij. Vogelvrij does mean outlaw, or free to be shot on sight, but the pun is in the reference to "vrij als een vogel (in de lucht)" or free as a bird. Paraphrasing: they don't shoot cyclists do they? In Groningen, they only ram them with police cars. And David, today's Dagblad van het Noorden emphasized that full chain-guards do not protect chains from road salt completely. There's work to be done (which is why they advised to switch to stainless steel chains, at twice the cost ...). A nice looking piece of machinery; I bet she manages to get up a good bit of speed on it. I remember, when I first came to NL and started cycling, that however fast I managed to go I was always humbled by a granny or two sailing past me on an omafiets. It was a very humbling experience. a few of the so called omafietsen (granny bicycles) are nowadays power assisted. Look for the big (!) hub on the front or rear wheel. So don't feel intimidated! Look if they are driving which such an ease, that this can't be true! Especially slopes. Theo: I know what Nick means. Grannies without electric assist can also be surprisingly swift. I think it simply comes down to having covered a distance unheard of in the UK outside of endurance cyclists, in a life-time of daily cycling in all weathers. Frits: Thanks for the explanation. Jokes and puns are perhaps the most difficult things for me to understand in Dutch. I read the DVHN article about chains today (it doesn't seem to be on their website). They cover all sorts of interesting points, such as some manufacturers using more quickly worn chainwheels now than used to be the norm. A chaincase isn't a perfect solution to chains getting dirty. Nothing is. However it does help a great deal. I'd not personally bother with stainless steel chains. Apart from improved aesthetics from the outside of the chain looking nicer, I can't see how stainless steel will help. What's more, if the chain is double the price people will expect it to last twice as long, which I don't think it will. IMO, a little oil applied occasionally is a better idea. I'm with David on this one. SS is a poor bearing material, therefore SS chains don't use it for the bearing surfaces. Those are still carbon steel and only the side plates are stainless. The rust resistance of an SS chain is purely cosmetic and the cosmetics of a chain are meaningless if the chain is in a case. Not only will people be inclined to think the SS chain will last longer, but they will be inclined to think it will do so with less maintenance; and thus give it less. As the relevant bits aren't SS it requires, however, exactly the same maintenance as a non-SS chain. There is no win scenario for SS. Save your money, get a regular chain and get used to the idea that you have to take care of it now and again. When I came to NL 20 years ago there weren't any electric bikes; it's just that the grannies were faster than me - more practise! Nowadays, though, I can keep up with them - and occasionally even overtake one. But not often, I admit, an electrically powered oma!